A phase III clinical study exploring the use of Xarelto (rivaroxaban) in preventing strokes and embolism in recent stroke patients has been stopped because Xarelto showed no more efficacy than the current recommended care, low doses of aspirin, while also demonstrating higher bleeding rates than aspirin. Johnson & Johnson’s subsidiary Janssen Pharmaceuticals made the announcement that the study is “stopping early for futility” in early October. Janssen Pharmaceuticals markets Xarelto along with Bayer Healthcare. The press release indicating the cessation of the study cited efficacy and safety concerns, noting that completion of the study, NAVIGATE ESUS, was not likely to demonstrate any reason patients should be prescribed Xarelto rather than the current standard of care, aspirin. NAVIGATE ESUS had enrolled roughly 7,200 patients at 459 sites in 31 countries. The purpose was to compare rates of stroke and systemic embolism rates among patients who took either Xarelto at 15 mg or aspirin at 100 mg per day. Although Janssen’s announcement termed bleeding rates overall “very low,” it also noted that the bleeding rates for Xarelto were higher than those for aspirin in the study. Janssen and Bayer face over 18,000 lawsuits claiming that Xarelto is associated with severe, uncontrollable bleeding that can result in death. 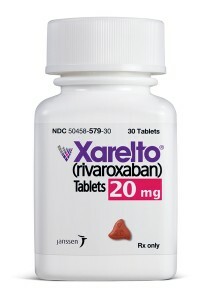 The Xarelto lawsuits allege that the manufacturers did not research Xarelto sufficiently prior to marketing it as a better alternative to warfarin for patients at risk for pulmonary embolism or other forms of blood clotting, and that they failed to warn medical professionals and patients that there was no reversal agent for Xarelto should uncontrolled bleeding occur. As a class, blood thinners may cause bleeding. But the side effects of warfarin, which was widely used before the introduction of Xarelto and other new-generation anti-coagulant medications, can be rapidly reversed with an antidote widely known to medical professionals. Pradaxa was another new-generation drug designed to prevent blood clots, and was rolled out before Xarelto. It also faced multiple lawsuits. Pradaxa’s manufacturer Boehringer Ingelheim agreed to settle the claims for $650 million just prior to the commencement of bellwether trials about the drug. The settlement equated to roughly $150,000 for each claim that had been filed. The number of claims involving Xarelto currently exceeds the number against Boehringer Ingelheim at the same stage of mass litigation.Further, it is anticipated that the number of suits filed regarding Xarelto will continue to rise, as it has been increasingly prescribed in recent years.